Rule 114D of the Income Tax Rules, 1962 (hereunder referred to as the “Rules”) specifies that every person referred to in clauses (a) to (k) of sub-rule (1) of rule 114C; and sub-rule (2) of rule 114C and who is required to get his accounts audited under section 44AB of the Income Tax Act,1961 (hereunder referred to as the “Act”) who has received any declaration in Form No. 60, in relation to a transaction specified in rule114B, shall furnish a statement in Form No. 61. 3. Modification/ changes in the schema / data structure of Form No. 61: The values under Statement Type of Form No. 61 have been modified / enhanced. 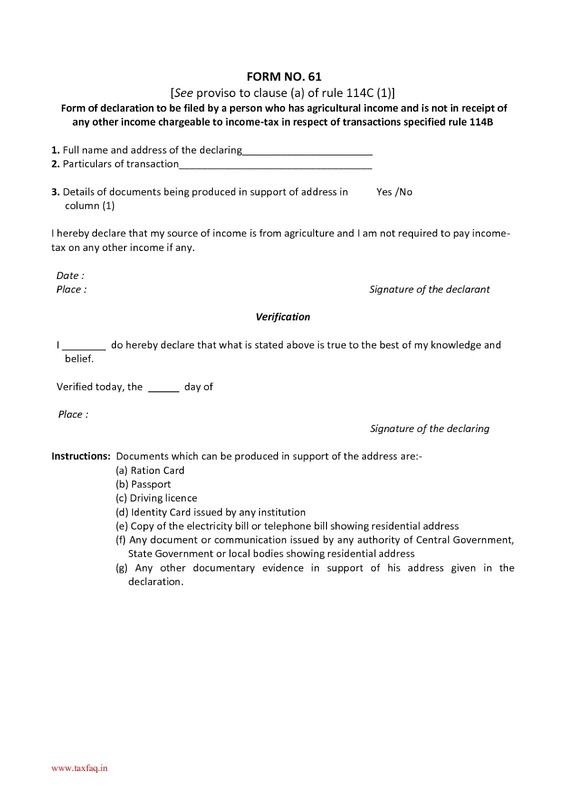 The detailed list of modification / changes in schema / data structure of Form No.61 is attached as Annexure A.
a) Already registered reporting persons/entities on e-filing portal: The registration details of already registered reporting persons/entities have been migrated from e-filing portal to Reporting Portal. The registered users of such reporting persons/entities shall be communicated of their new login credentials through registered e-mail to be used at Reporting Portal. There is no need of registering again for such persons/entities. registered mobile number. There will be no option to de-activate ITDREIN, once it is generated. 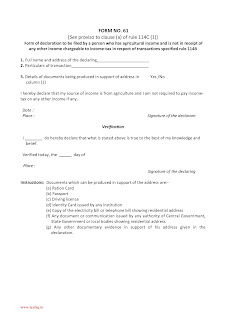 c) Submission of Form No. 61: Every reporting person/entity is required to submit the Statement in Form No. 61. The prescribed schema, Report Generation and Validation Utility for Form No. 61 and Generic Submission Utility can be downloaded from the Reporting Portal under “Resources” tab. The prepared Statement to be filed is required to be digitally signed by and uploaded at the Reporting Portal or through Generic Submission Utility through the login credentials (PAN and password) of the Principal Officer. d) Submission of correction statement: In case, the reporting person/entity comes to know or discovers any inaccuracy in the information provided in the statement or the defects have been communicated to the reporting person/entity through Data Quality Report (DQR) after submission of Statement, itis required to remove the defects by submitting a correction statement. The number of “Reports Requiring Correction (RRC)” will be visible against the original statement on Reporting Portal under the ‘Statement Pending for Correction’ tab. The user can download the DQR file from the DQR column under ‘Statements Pending for Correction’ Tab of Reporting Portal, which can then be opened on the Report Generation utility to find and fix the errors. The reporting person/entity needs to rectify all the defects till the number of “Reports Requiring Correction (RRC) becomes zero within the specified period. e) Deletion of Submitted Reports in a statement: In case, the reporting person/entity wishes to delete the inadvertently filed reports within a statement, it can choose the statement type as “Deletion Statement” and file all such reports within a single statement to be deleted with exact previously filed values against within a single statement to be deleted with exact previously filed values against each field. The manner of filing Deletion Statement shall be similar to submission of correction statement. f) Modification/ changes in the schema / data structure of Form No. 61: The values under Statement Type of Form No. 61 have been modified / enhanced. The detailed list of modification / changes in schema / data structure of the Form No 61 is attached as Annexure A.
h) This notification shall come into effect from 09''' of April, 2018.